San Francisco’s cable cars are the only National Historic Landmark in the US that moves. 9.7 million people ride them each year. Denim jeans were invented in San Francisco for miners who came in the gold rush, as they needed clothing that was comfortable but tough. The Golden Gate Bridge has 23 miles of ladders and 300,000 rivets in each tower, plus enough steel wires in its cables to circle the earth 3.5 times. The Chinese fortune cookie was invented in San Francisco, at the Japanese Tea Garden. Golden Gate Park is home to a herd of bison, the last remaining species of a free-range zoo within the park that once had elk, bears, goats, and buffalo. San Francisco is at the center of California’s Bay Area, a busy metropolitan region with a population of more than 7 million. Regarded as one of the world’s great cities, San Francisco has a unique vibrancy and culture, with a lively history and a world-class dining scene, cultural events, ethnic neighborhoods, and icons of world architecture such as the Golden Gate Bridge. 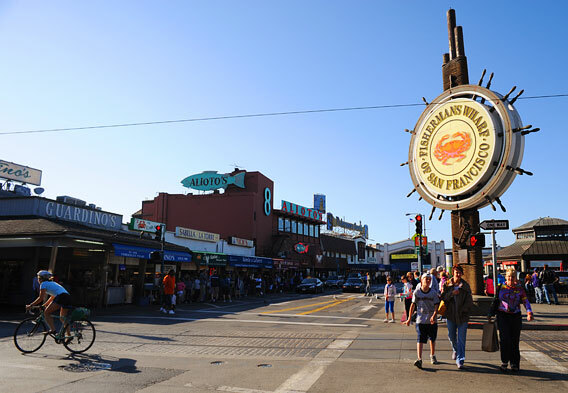 Located on the peninsula dividing San Francisco Bay from the Pacific Ocean, the city has a lively historic waterfront that includes the famous destinations of Fisherman’s Wharf and Pier 39, as well as the nearby gourmet market at the Ferry Building Marketplace. Throughout many of the neighborhoods of the city, the distinctive historic San Francisco cable cars ply the streets, offering unique views of postcard-perfect San Francisco row houses and other sights. The history of San Francisco is as lively and interesting as the city itself has become. When the Gold Rush of 1848-49 (which gave the local pro football team its name) drew thousands of gold prospectors to California, San Francisco became a center of industry, with companies such as Wells Fargo, Levi Strauss’ dry goods business, and Ghirardelli Chocolate all established in the city. The immigrant population also boomed, as Chinese laborers came to work on the railroads and to start small businesses, ultimately creating one of the oldest and largest Chinatowns of any US city. In 1906, the San Francisco earthquake and resulting fire destroyed much of the city. Despite the setback, San Francisco city authorities and residents rebuilt and beautified the city, establishing city parks, luxurious hotels, the Palace of Fine Arts, and a renovated City Hall. By the 1930s, the city was again a world leader, with architectural wonders such as the Golden Gate Bridge and the Bay Bridge being built during this time, but it also gained some notoriety as the famous prison on Alcatraz housed some of the most infamous prisoners of the period, including Al Capone. 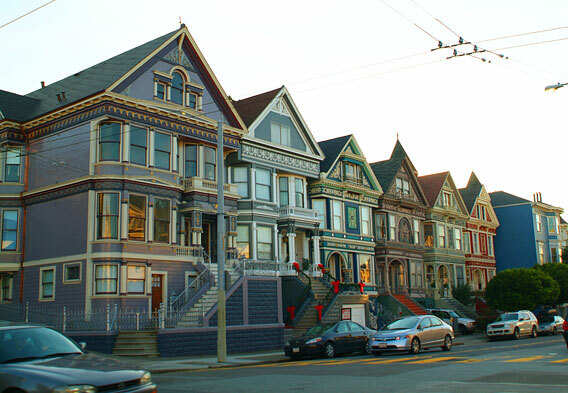 The counterculture and gay rights movements of the mid-twentieth century helped create the colorful neighborhoods of Haight-Ashbury and the Castro District, and though the city was damaged in the 1989 earthquake, it was again rebuilt and continues to thrive. Today, San Francisco is one of the most-visited cities in the world, with tourism at the top of its industries. The city is one of the country’s leaders in liberal culture, with energetic hippie and artists’ enclaves. The area is also a world leader in business and technology, with Silicon Valley at the south end of the Bay Area home to many of the world’s largest high-tech firms. 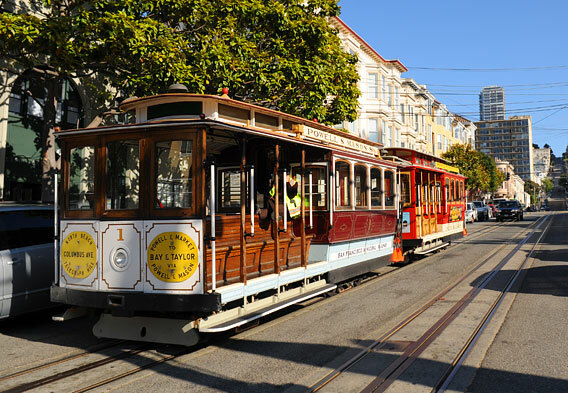 The historic San Francisco cable cars are a famous and distinctive sight as they roam the hilly roads of the city. There are three main routes following the city’s main thoroughfares: Powell & Hyde, Powell & Mason, and California, which can take you from the Ferry Building to Fisherman’s Wharf, from the Financial District to the mansions of Nob Hill, and on to Ghirardelli Square. Tickets can be purchased with cash as you board, or a one-day pass gives visitors unlimited use of streetcars, buses, and cable cars throughout the day. Fisherman’s Wharf, located on the waterfront, is one of San Francisco’s top attractions. The street stands and carts down by the wharf serve up seafood such as fish and chips, clam chowder, and fried calamari, while nearby boutiques sell souvenirs and salt-water taffy. Walk down Pier 39 for a carnival of shops and boutiques, as well as restaurants offering free samples of their unique clam chowder recipe and great views of the bay. One of the biggest draws on the pier is the cluster of California sea lions, and visitors can watch animals as they bark, play, and nap in the sun. The neighborhood of Haight-Ashbury was the center of the hippie movement in San Francisco during the 1960s, and it retains its countercultural vibe. Check out the record stores, coffee shops, and independent bookstores in the neighborhood, as well as the quintessential San Francisco row houses, and end your visit with a stop at Hippie Hill in Golden Gate Park. You can also take the Haight-Ashbury Flower Power Walking Tour, which explores neighborhoods and sights that were important during the 60s movement, and ends with a visit to the Psychedelic History Museum.